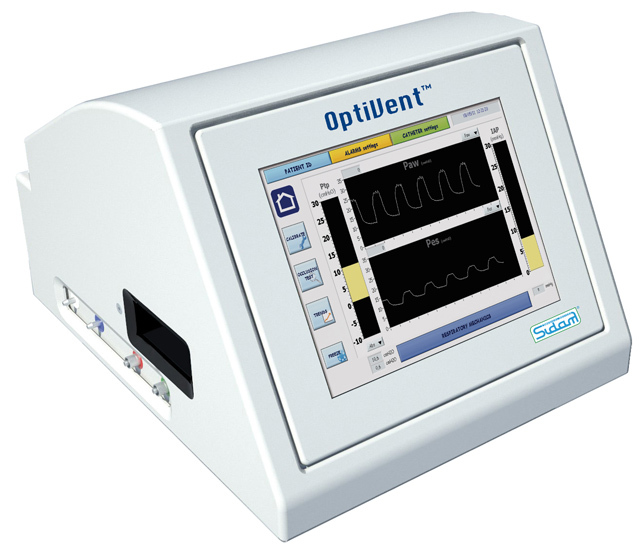 OptiVent™ is an electro-medical device for the completely automated management of the multi-functional Nutrivent™ nasogastric probe. • transfer of the data registered on the computer. The equipment is provided with a practical touch screen interface for an immediate input of the requested data and for a simple interaction with the system. OptiVent™ allows to register and monitor, in continuous mode, basic parameters in the management of the critical patient: transpulmonary pressure (Ptp),, Elastance (E), Compliance (C), inspiratory effort, endoabdominal pressure Pga (with NutriVent™ provided with two balloons), transdiaphragmatic pressure (with Nutrivent™ provided with two balloons). The registration of the esophageal pressure allows to split Elastance and Compliance into their components: of the whole respiratory system (Ers, Crs), of the lung (EL, CL). of the chest (Ecw, Ccw). 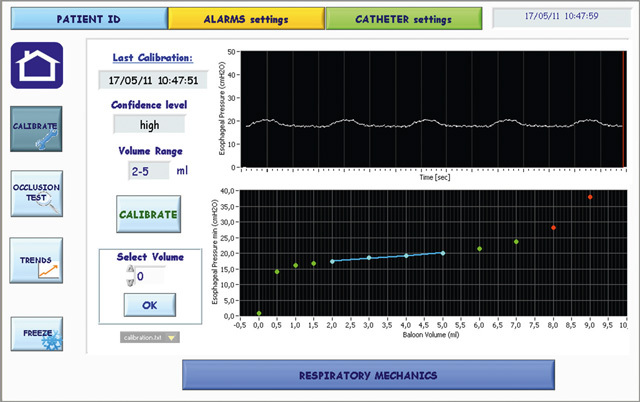 During this operation, the software inside the device determines the most suitable inflation volume of the esophageal balloon for the single patient. 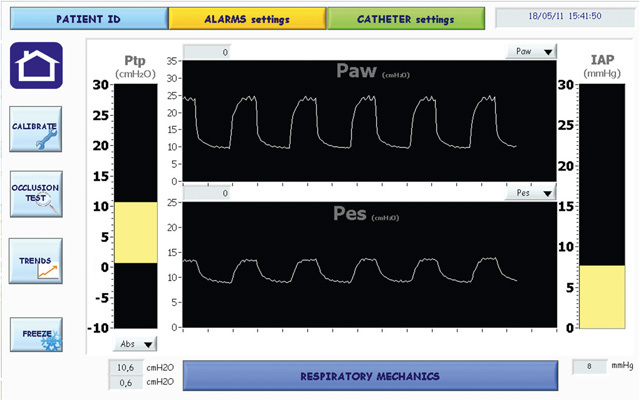 The balloon is inflated at different volumes and the software sets the best volume for the optimal transmission of the pressure signal from the patient to the equipment. Moreover, the system corrects the signal registered by eliminating the cardiac and esophageal artefact. 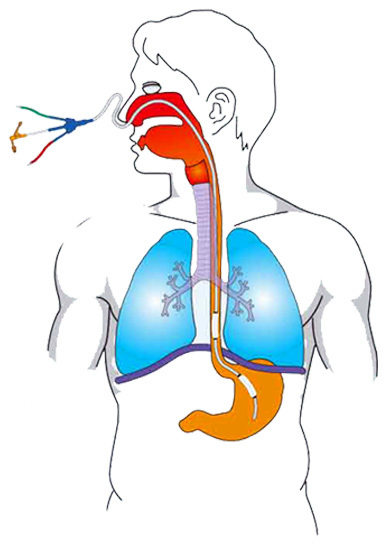 it is absolutely possible to define if the position of the esophageal balloon is appropriate by performing an occlusion of the respiratory tract and checking that the variations of the esophageal pressure comply with the ones of the respiratory tract. On the screen of the equipment are displayed two traces, which can be of pressure (esophageal, gastric, respiratory tract), of flow or of volume. The two traces can be selected by the user. 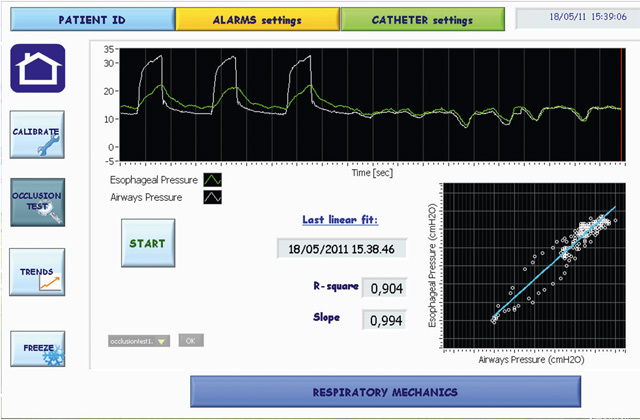 By simply pressing a button, it is possible to recall the summarizing screen page of the ventilator parameters, in all their components.